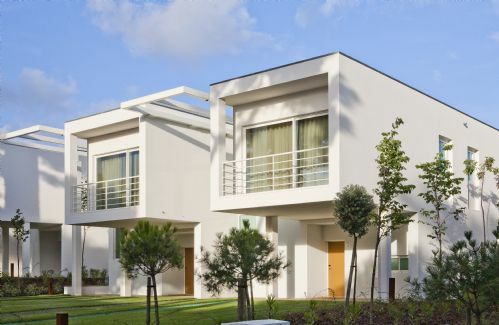 Description: The beautifully fitted Interconnecting rooms each with an en suite bathroom with a shower and bath, offer parents the ability to have their own privacy in their large bedroom while having their children right next door to them – all in a large combined palatial space of 80 sqm (880sq feet). This hotel is fantastic for families with young children. They have an amazing kids club and people at hand during meals time to help with the children. We had a connecting room which was fantastic but we saw other rooms with bunk beds which should also be ok for families with children. The food is also great but the restaurant is a bit slow so being patience during busy eating periods is key! Overall we would really recommend this hotel and the staff are just amazing: polite and helpful at all times. The pools are great (just a bit cold) and the playgrounds are to dream of. We would come back for sure and we can imagine a better place for parents to relax. Description: The beautiful suites of 60sqm have large bathrooms each with a shower and a luxury bath. All beds are super king size (2.20m x 2m) and can be arranged into twin beds where required. The bedroom can be separated from the living room by a pull out wooden screen. Description:The beautifully fitted rooms are large measuring 40 sqm each (440 sq feet) with large bathrooms each with a shower and a luxury bath. The Superior rooms have been fitted with Italian designer bunk beds to accommodate children to give families the comfort of staying in the same room. All beds are super king size (2.20m x 2m) and can be arranged into twin beds where required. 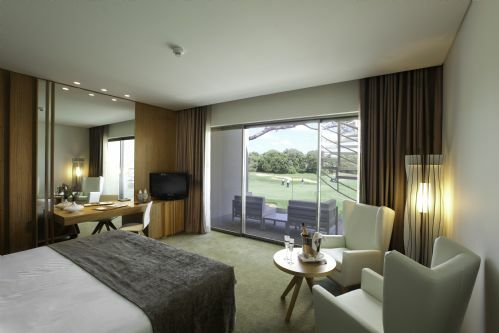 All hotel rooms have huge windows and extend out onto spacious balconies with beautiful views either over the water features, garden and pool area in the hotel or the greens of the adjacent Quinta da Marinha golf course. Free Wi-Fi is available throughout the resort. Nearest beach is 5 minutes drive. Description:There are 12 contemporary and stylish villas right next to our Kids Clubhouse and green areas/ heated pool for families. They all have a contemporary architecture and modern conveniences and have a total space of around 100 sqm (1,100 sq ft). There are 2 bedrooms upstairs, each with its own ensuite shower room. Beds are all super king size (2.20m x 2m) and each has a kitchen complete with a stove, dishwasher, fridge and basic crockery, cutlery and pots and pans to make your stay in Greater Lisbon perfectly manageable, and even more importantly, enjoyable with little children. The villas don’t have washing machine but a great family laundry service is available. Each house has a large terrace with family seating on the ground floor that overlooks a green area and the Clubhouse pool area. Our family concierge services enables you to pre-organise little details like bottle warmers, bottle sterilisers, etc prior to arriving at our hotel. Free Wi-Fi is available throughout the resort. Occupancy: The price shown here is based on 2 Adults and 2 Children 12 years and under sharing a Grand Deluxe 2 Bedroom Villa with breakfast. Description: There are 12 contemporary and stylish villas right next to our Kids Clubhouse and green areas/ heated pool for families. 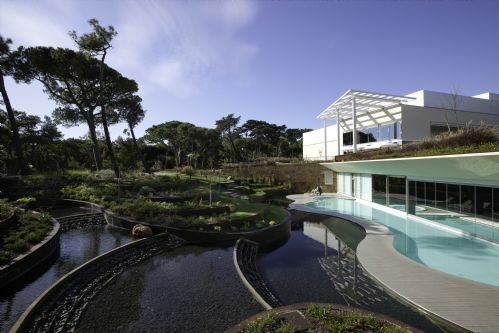 They all have a contemporary architecture and modern conveniences and have a total space of around 100 sqm (1,100 sq ft). There are 2 bedrooms upstairs, each with its own ensuite shower room. Beds are all super king size (2.20m x 2m) and each has a kitchen complete with a stove, dishwasher, fridge and basic crockery, cutlery and pots and pans to make your stay in Greater Lisbon perfectly manageable, and even more importantly, enjoyable with little children. The villas don’t have washing machine but a great family laundry service is available. Each house has a large terrace with family seating on the ground floor that overlooks a green area and the Clubhouse pool area. Our family concierge services enables you to pre-organise little details like bottle warmers, bottle sterilisers, etc prior to arriving at our hotel. Free Wi-Fi is available throughout the resort. Occupancy: The price shown here is based on 4 Adults and 2 Children 12 years and under sharing a Grand Deluxe 2 Bedroom Villa with bunk beds with breakfast.